This job is located in Venice. We installed a stand alone bar with storage, two fridges, a Memphis pellet grill and a Vent a Hood hood vent. 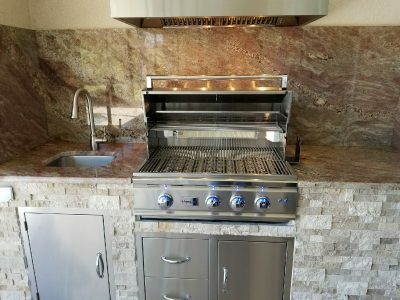 The unit and walls are covered in Travertine stone and the countertops and backsplash feature a level 5 granite. 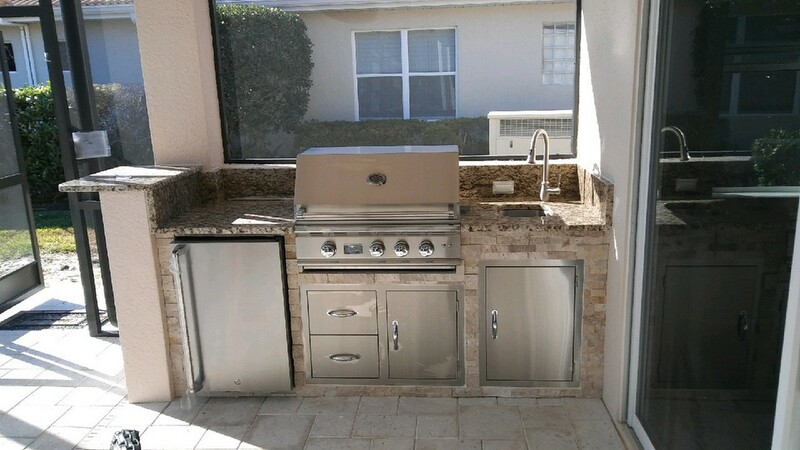 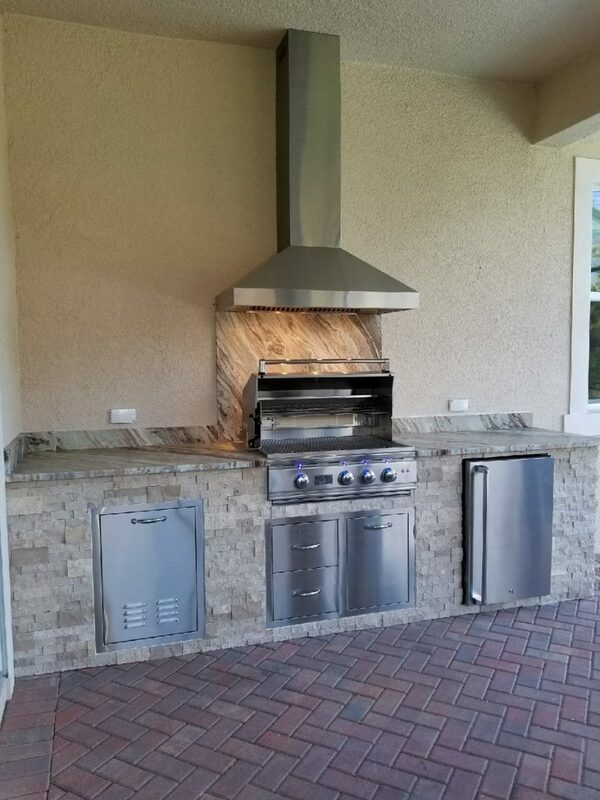 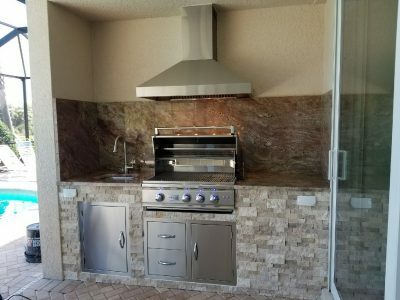 This Venice customer wanted a tiled backsplash and face for their unique outdoor grilling area. 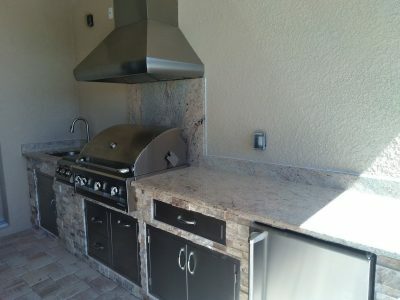 The countertops are a level 5 granite and the appliances are from Summerset. 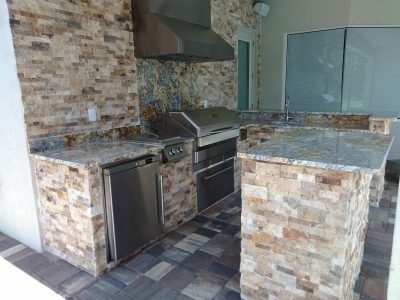 This Venice lanai is now home to a beautiful, custom outdoor kitchen with appliances from top brands like Artisan (grill), Blaze (side burner) and Summerset (drawers and fridge). 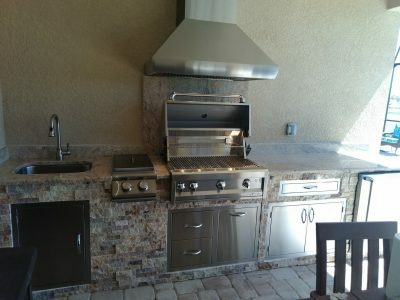 This kitchen features a Summerset grill with a door and drawer combo, and a sink with access door. We had to do a custom header to run the duct work for the hood vent. Located in Venice, this kitchen is complete with a trash pullout, self recirculating hood vent and Summerset appliances. 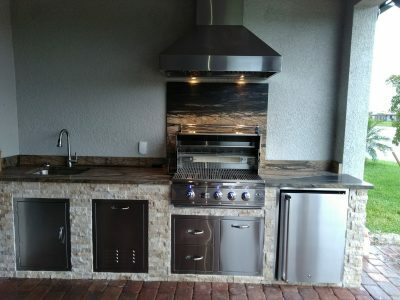 This was a smaller job where the customer just wanted a fridge and sink built in next to their grill. 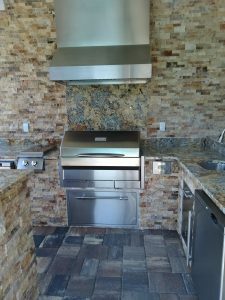 We installed a level 4 granite on top and gave them Blaze appliances with a triple drawer door combo and a sink. 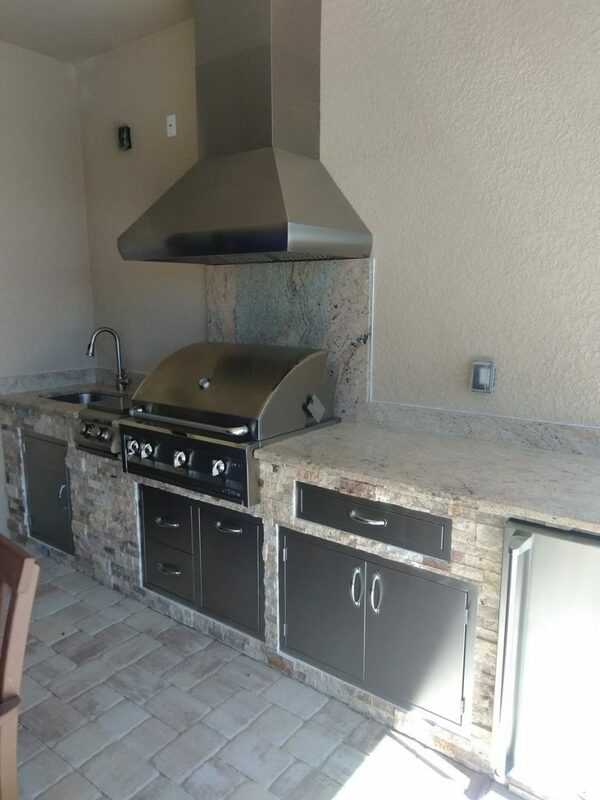 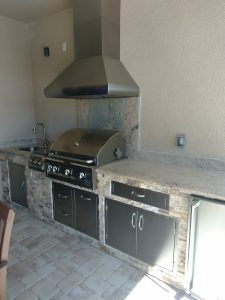 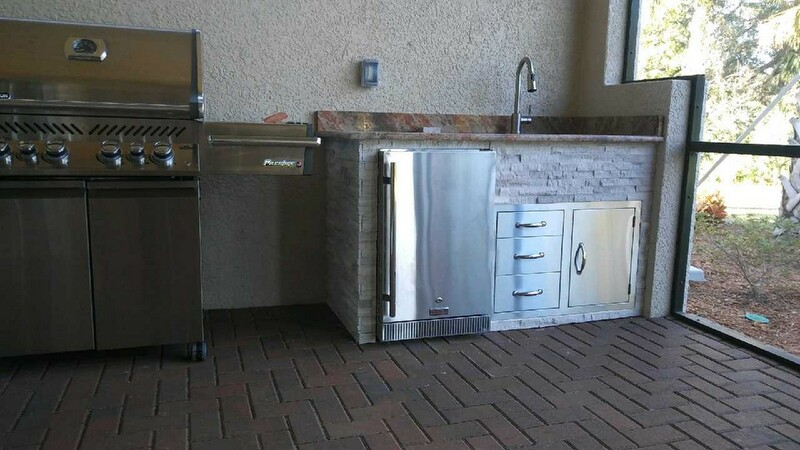 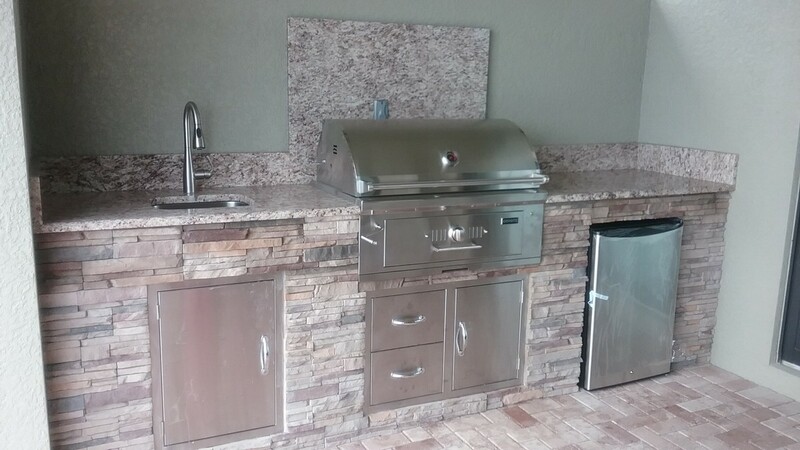 This custom grilling area has a Summerset TRL Grill and a standard fridge with an upgraded door sleeve. This kitchen we created and installed for a home in the Venice Island Walk Community features a charcoal grill by Coyote. 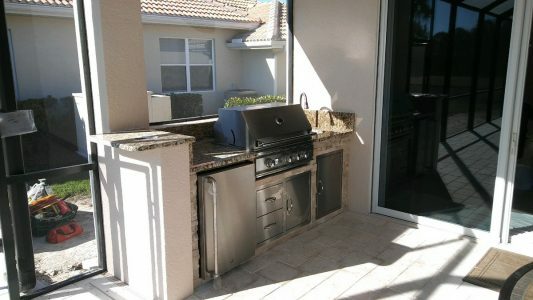 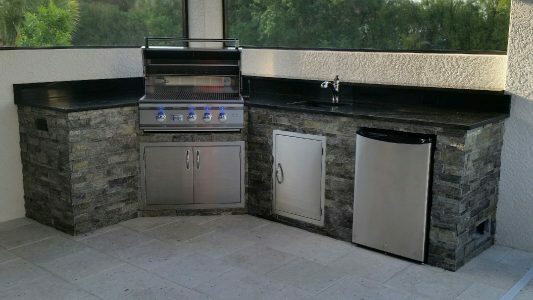 These customers wanted a deluxe outdoor kitchen in their Venice home, but they had some space constraints to consider. 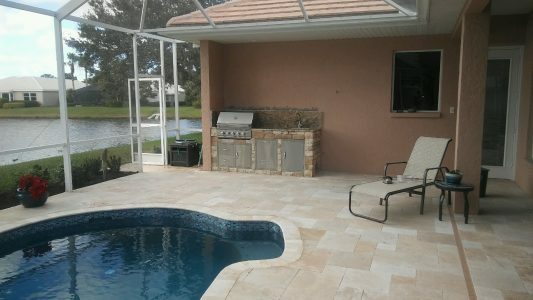 The pool is only two feet to the right of the area shown in the photo, limiting their placement options. We worked to make the best use of the available space and showed them several different layouts. 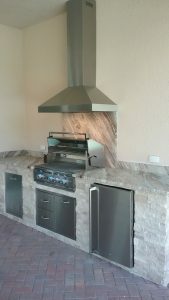 This L-shape corner design was the only layout out of seven that truly fit their needs and the space. 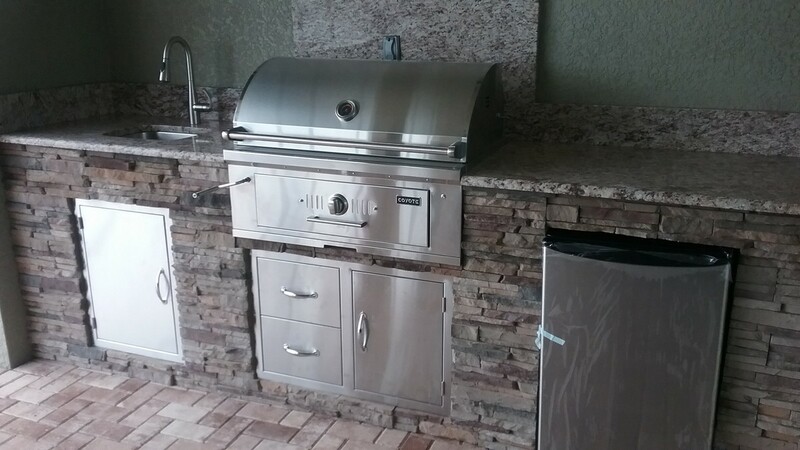 The customers decided on the popular Summerset 32” TRL grill as the focal point of the design. 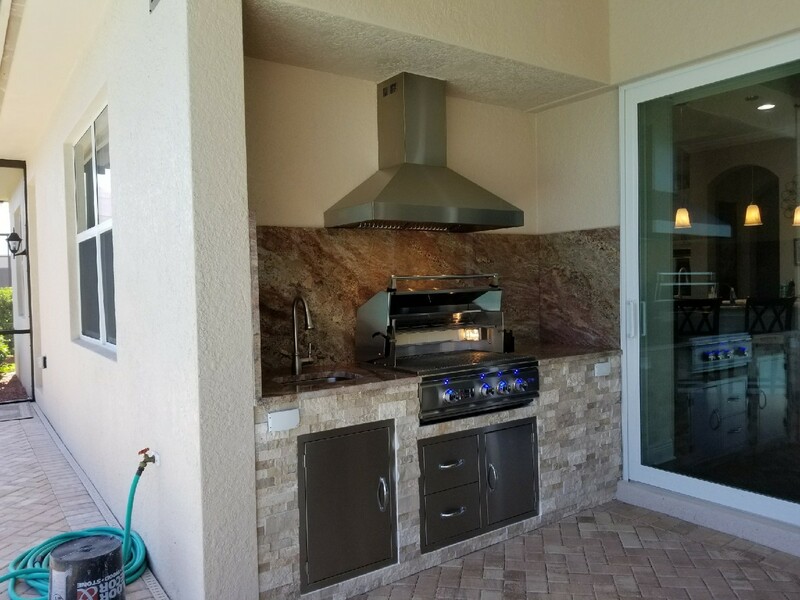 They had previously purchased Bull double doors, but we allowed them to trade the doors for a set from Summerset to match their grill. 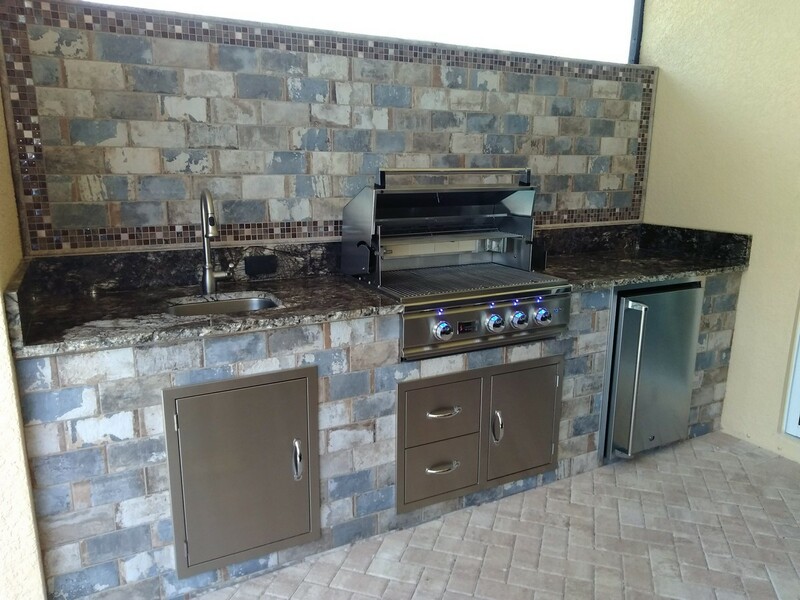 Inside the double doors is one large cabinet – perfect for storage. But the real beauty of this Venice outdoor kitchen design arguably lies in the luxurious black granite and the quartzite stone veneer. 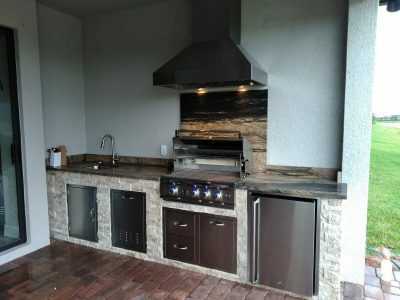 We even custom-ordered black outlet covers so as not to interrupt the sleek, black appearance of the granite. The placement of the grilling area in this Venice home was a logical choice. 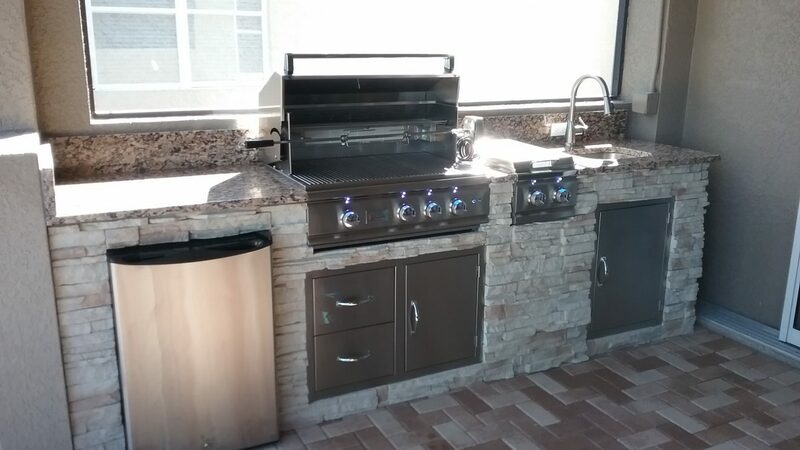 It was pre-plumbed and the natural gas lines had been pre-run, leaving us with only some light electrical work to do to make everything functional. 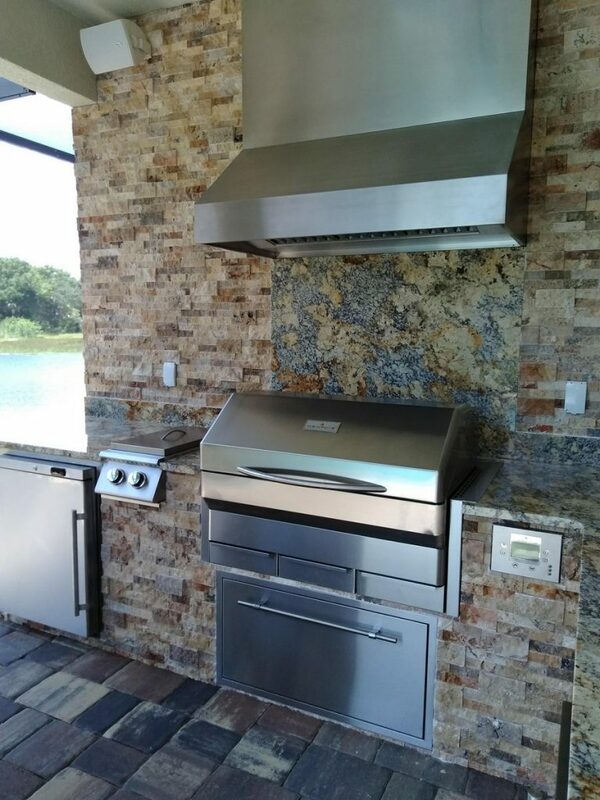 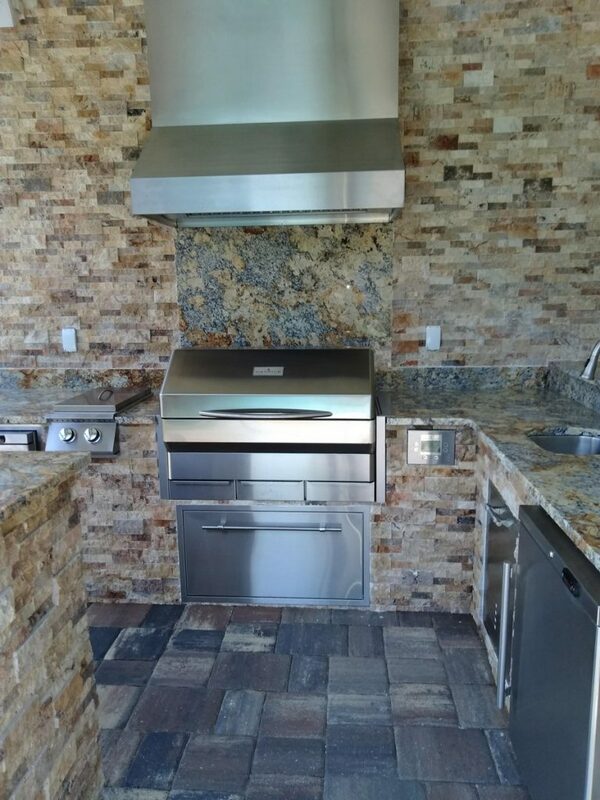 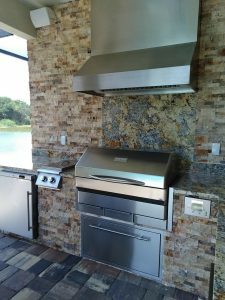 We installed a Summerset TRL grill with rotisserie, a double side burner, a mini fridge, a sink with a large access door, and a door and drawer combo under the grill for storage and gas line access. 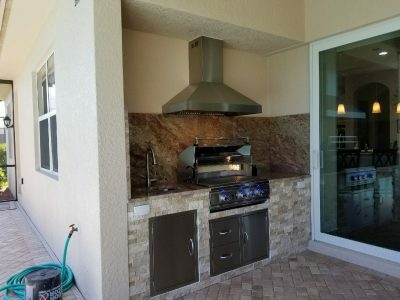 The cast concrete stone work and granite countertops match the neutral colors of the lanai, beautifully completing the customer’s unique outdoor entertaining space. 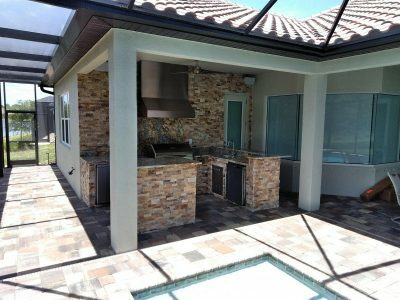 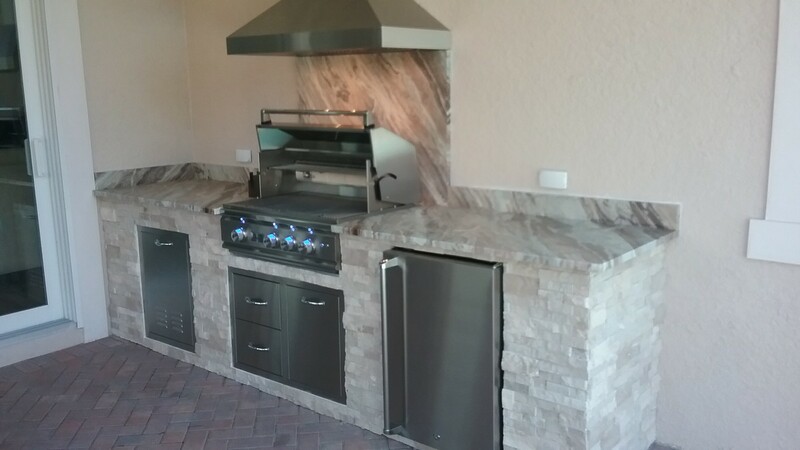 This Venice Golf & Country Club home already had an existing outdoor kitchen. But the homeowners decided that it was time for an upgrade. We ripped out what was already there and covered it with a new frame and full height backsplash to conceal the existing tile work. 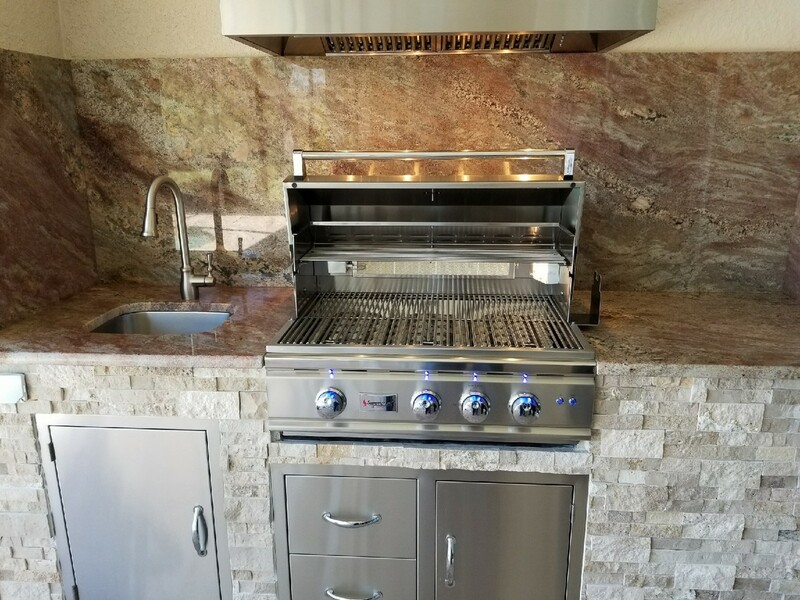 The new “toys” include a Summerset grill, a pull-out propane drawer, a sink with a soap dispenser, and doors and drawers for storage and access to the plumbing. 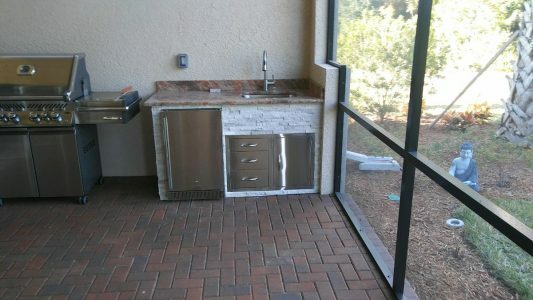 We were able to tie into the existing plumbing, thanks to an outdoor shower on the other side of the wall next to the grill. 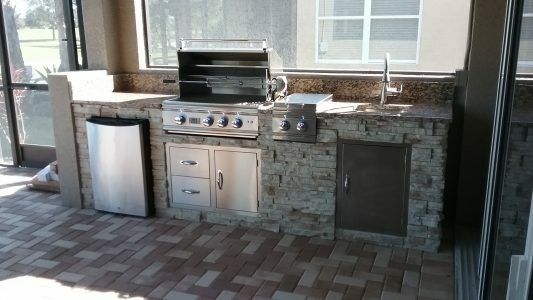 This resulted in a savings of time and money for the homeowner.